Ginkgo biloba, commonly known as maidenhair tree or simply ginkgo, is one of the most unusual and striking plants in the Seattle Japanese Garden. A deciduous tree with unique fan-shaped leaves, it has glowing golden-yellow fall color that rivals the autumn display of Japanese Maples. Despite its broad deciduous leaves, ginkgo is more closely related to conifers (woody plants, such as pines and firs, with needle or scale-like foliage) than to maples or other deciduous trees. In the Seattle Japanese Garden, three tall, slender specimens grow along the path at the southeast edge of the pond – two in Area F and one in Area H. Their beautiful fall color, pictured above, is not long-lasting, and their leaves drop almost all at once, blanketing the ground. In Ginkgo: The Tree that Time Forgot (2013), Peter Crane “sets out to tell ginkgo’s evolutionary and cultural life story.” As he states, “there is no other tree with a prehistory so deeply intertwined with that of our planet.” Ginkgo biloba is a “living fossil” -- “a botanical oddity, a single species with no close living relatives.” It belongs to Ginkgoales, a once-flourishing order of prehistoric conifer-like trees that extends back in time over 200 million years. To me, ginkgo’s evolutionary story is fascinating, and helps put in perspective our own relatively short time on earth. However, even a brief telling of ginkgo’s story requires several paragraphs dense with botanical terms and processes. This blog article, Part One of a two-part series, covers its botanical uniqueness and place in plant evolution. Feel free to skip Part One and wait for Part Two, appearing in December, which deals with ginkgo’s cultural meanings, historical uses, and the growing conditions it requires. Peter Crane’s research reveals that ginkgo trees were under cultivation in China by the late 10th or 11th century, and several centuries later were taken to Korea and Japan. First planted in China near temples and in orchards, ginkgo trees also came to be widely cultivated in cities. Despite claims of very old Japanese trees, Crane hasn’t found reliable evidence of ginkgos growing in Japan before the early 15th century. Ultimately, Japan was opened to the West, and ginkgo seeds and cuttings were sent to Europe. Later in the 18th century, they were taken to North America – and eventually to the earth’s other temperate regions. Since then, Ginkgo biloba has become one of the most widely planted and recognized of the world’s trees. “Seed plants” consist of two major groups of highly evolved land plants utilized by humans. Angiosperms (flowering plants, including most of the plants we use for food and ornament) are the most evolved, and now dominate earth’s plant life. Most form seed-bearing structures botanically known as fruits. Gymnosperms (translated as “naked seed”), are more primitive and prevailed in the age of dinosaurs. They include ginkgos and conifers (which hold their “naked seeds” within cones), and do not produce true fruits. Among angiosperms, the genus Ginkgo is more primitive than and predates most conifers. Ginkgo trees are dioecious – that is, individual trees are either male or female. Their means of sexual reproduction is a relatively primitive water-reliant process – in fact, it’s intermediate between early vascular plants (plants with water-conducting tissues), such as horsetails and ferns, and the more advanced conifers. Male ginkgo trees produce pollen grains which release swimming (motile) sperm into a kind of “inside sea” -- a watery medium that allows the sperm to swim to the egg they fertilize. (Conifers, on the other hand, form a pollen tube that delivers non-swimming sperm directly to the egg.) Crane argues that swimming sperm is an evolutionary vestige from ginkgo’s aquatic ancestors, revealing its unique and ancient place in the history of our planet. Older ginkgo trees are also capable of reproducing asexually. They produce woody peg-like structures that grow downward from large branches. If they contact the ground, they’ll root and form leaves -- and eventually new trunks. Another aspect of ginkgo’s place in evolution is its unique fan-shaped leaves on long, slender, flexible stems (petioles), so unlike the needle or scale-like foliage of conifers. The flat, broad leaves have veins that radiate out into the leaf blade and branch off from one another. This is a more primitive pattern than that of flowering plants, in which the veins form a web-like network. The above photo shows these elegant leaves with their all-too-brief autumn coloration. Growing in clusters at the ends of short shoots or alternately on long shoots, ginkgo leaves resemble the leaflets of maidenhair ferns -- hence one of ginkgo’s common names, maidenhair tree. The Swedish naturalist Linnaeus gave the genus its scientific name, Ginkgo, which was transliterated from the Japanese word for “silver-apricot.” He added the species name, biloba, which means “two-lobed” and refers to ginkgo’s flat and irregularly notched leaves. Often deeply grooved in the middle, they appear to have two distinct lobes. They resemble a two-lobed fan or even a duck’s webbed foot -- hence the Chinese common name i-cho (translated as duck’s foot). As seen in photos and drawings, some ginkgo leaves do not have this characteristic leaf division. Ginkgo bark is brown or gray and corky, becoming deeply furrowed with maturity. The wood -- white or pale yellow, is soft, lightweight and weak. Although ginkgo has neither needles nor cones, its relationship to the conifers is reflected in its typical pyramidal form. Young trees tend to have a strong upright leader. With great age, however, ginkgos become more picturesque and their habit wide-spreading. Individual ginkgo trees are long-lived, with old specimens becoming very large. With time, trees reach 50 to 100 feet in height, and may spread wider, becoming massive in their girth. According to Crane’s research, large European ginkgos are less than 300 years old, despite claims to the contrary. However, there is strong evidence that some trees in Asia, notably China, have attained an age of 1,000 years or more. This prehistoric tree has left its imprint on our state at Vantage, in eastern Washington. Rare specimens of petrified ginkgo trees were discovered in 1932, and are displayed there in both indoor and outdoor exhibits. Ginkgo Petrified Forest, now a registered National Natural Landmark, is recognized as one of North America’s most diverse fossil forests. I remember visiting Vantage as a child and being amazed by this ancient tree, long before I knew anything else about it. 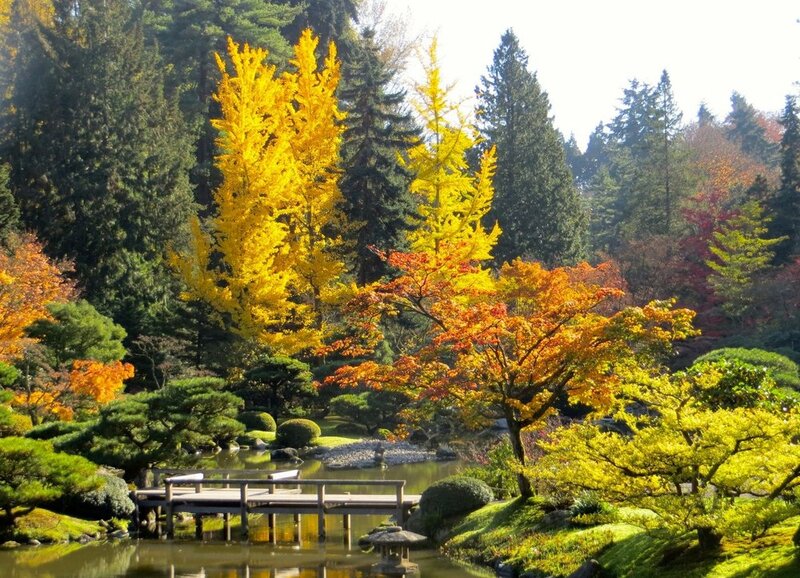 Now, whenever I visit the Seattle Japanese Garden, with its three statuesque ginkgos, I relive my childhood delight and amazement, and am reminded of the brief period of time we humans have inhabited our planet.